Of all the hassles inherent to modern day air travel, funneling through winding security lines is the worst. There's just something particularly degrading about having to scramble to remove your shoes and fish out your laptop and liquids in a sea of harried strangers. Soon, though, everyone will be able to breeze through security without stopping to take clunky things out of their bags. The Transportation Security Administration (TSA) just announced it's rolling out new carry-on baggage scanners that will allow them to relax the rules. In an effort to revamp the passenger screening process and cut down on long security lines, the TSA announced last week that it's installing new carry-on bag scanning machines that can create 3D images of the bags' contents and automatically detect items that you are currently required to remove, like laptops, liquids, and other electronics. The agency says it has purchased 300 of the computed tomography (CT) machines, and will begin rolling them out this summer, per a report from Bloomberg Government. Thrillist reached out to the TSA, which said details are not yet available on which airports will be the first to receive them. 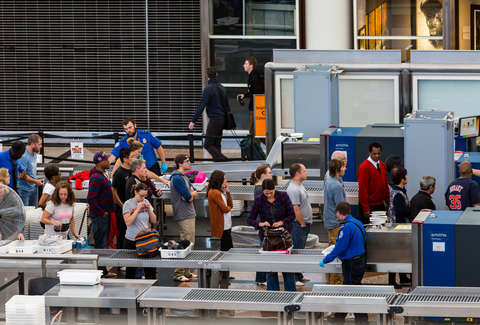 During the testing period, the TSA didn't see a noticeable reduction in line wait times, though it expects that will come with time once staffers are up to speed on the relaxed screening rules enabled by the new machines. So, it looks like you'll have one less thing to dread when traveling. Our national nightmare of fumbling though toiletries and other belongings at the airport while simultaneously struggling to remove a belt and shoes in a timely fashion may soon be over. Until then, though, there's always TSA PreCheck.